There’s not a lot of news out there but KVUE has a report (with video): Apparently a 1-engine Cessna crashed onto the Echelon building. [UPDATE]: Two people still unnacounted for. Let’s hope they’re ok! 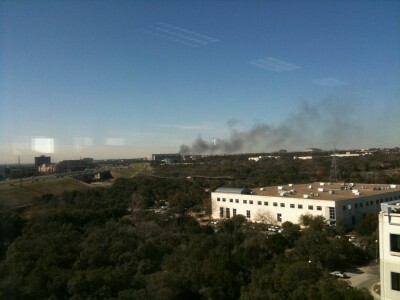 [UPDATE 1:13 PM]: There was a big column of smoke I could see from my building this morning (before the crash). It was a house on fire. It’s possible that this is the house of the pilot that smashed a plane this morning, Joseph Andrew Stack. His suicide letter is online on his website. Thanks for the recap. Kind of amazing that you can see smoke from both this kooks house and the building. I hope he’s burning in you know where just knowing that so many people were able to get out of the building safely.